The Almond tree is in full bloom by now, at least those in sheltered places are and it’s a delight to the eye and the senses, their scent being subtle and sweet. To see these blossoms to me is just wonderful as it is something totally exotic in my book and my imagination is heightened merely by the beauty of this happening. 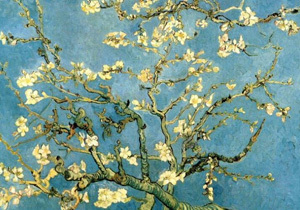 The Almond blossom has inspired literary and artistic people through the ages it seems. Van Gogh painted it beautifully and often when he was in Southern France, for him they signified awakening and hope. Almond blossoms have been used in legends in countries like Portugal, and in the bible there is mention of them too in several place. The Almond tree was first cultivated in the Mediterranean about 3000BC. It is said native to Syria and Palestine. Almonds were carried on the trade routes by the Greeks, Egyptians and Romans. According to Greek mythology the Queen of Thrace, Phyllis was turned into an Almond tree by the gods. I will never forget myself the rapture when watching a movie called ‘Venus’ which made good use of Wagner’s Tannhäuser Overture, at some point, during the performance of this opera the pilgrims chorus, which to me is the most beautiful part, the staff of a pilgrim starts to blossom, it was an Almond blossom, it was a stunning moment, never left me since. According to the book: “Myths and Legends of Flowers, Fruits, Trees and Plants” by Charles M.Skinner, branches of the Almond tree are used to find hidden treasure. Here is a link to the book, and there you can also read a summary of Wagner’s Tannhauser story and how the Almond branch figures in it. I was not really aware of the fact that to me also the Almond blossom has great significance, but it has, and to see the blossoms here on Gozo opening up over the last few weeks has delighted me beyond words. Thank you, Agnes for sharing the beauty of the almond blossoms and the poetic and artistic expressions they inspired. Ja het is zo prachtig en geurig.